Another week in the crypto market. Since November, Bitcoin’s price continues its correction to the $3,500 price range where the support holds and provides a feeling of market stabilization. The ETF is in the headlines again, and at the end of the month, we will know whether the SEC will approve the first Bitcoin ETF. The market finds it hard to believe there will be a positive answer, and in any case, we will learn how waiting for an answer has affected the market. It seems that the market is already behind the media hype, has calmed down, and today there is a more pessimistic approach towards the future of the market. However, the Alternative coins are experiencing an awakening trend, as we saw when AUGUR rose around 100%. In addition, the Airdrop trend continues along with a declining interest in the ICOS phenomena. The awakening in the Alt’s market is highly dependent on Bitcoin’s price, and this pattern repeats itself when the Bitcoin price is steady or rising. If Bitcoin’s correction continues, it is likely that we will see the Alt’s price plummeting as this is the market’s pattern of behavior. Despite the many attempts to create a “better than Bitcoin” coin, there is still no Alt that threatens it. Since the entire crypto market was affected by the DAO case, no project has succeeded in threatening Bitcoin’s place, and it seems that the market has already forgotten that case. Manipulations in Exchanges – Recently, there has been widespread talk about manipulations being made in the various trading arenas, and sometimes there are suspicions about the Exchanges themselves manipulating the volume to try to register new coins or inject hacks when they drop the loot into their pockets. In addition to the advantages of market deregulation, there are also drawbacks that make it difficult for users to make sure that they are in contact with the “good” players in the cryptospace. In conclusion, it can be said that the market is licking its wounds after a significant correction. And it is not clear whether it has ended. However, there is a good chance that we have reached the floor with a market cap of around $119 billion. It is interesting to see if the market will be able to keep its head above $100 billion. Bitcoin Dominance stands at 52.5% and continues proudly to lead the market. Ethereum’s Constantinople Upgrade Delayed After Security Vulnerability Discovered. The Ethereum network upgrade, which got the whole blockchain community prepared, was postponed a second time, citing ‘reentrancy’ attack vulnerability. tZero Announces the Launch of its New Regulated STO Platform. tZero, the blockchain arm of Overstock, said it would launch a new STO platform next week, with plans to create its own STO. Could The US Government Shutdown lead to a Bitcoin ETF approval? 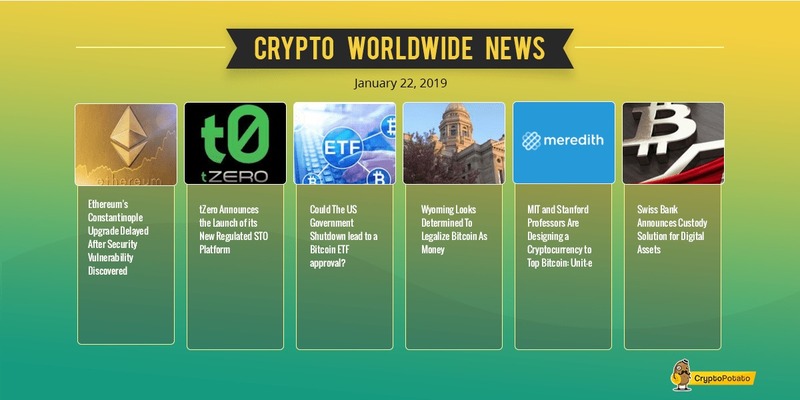 The crypto community is speculating whether the US shutdown may be an automatic ticket for the approval of a Bitcoin ETF, but here’s what a legal expert has to say. Wyoming Looks Determined To Legalize Bitcoin As Money. Wyoming may become the first US state to classify cryptocurrencies as money, according to a newly introduced bill, which will also permit banks to offer crypto custody services. MIT and Stanford Professors Are Designing a Cryptocurrency to Top Bitcoin: Unit-e. A team of professionals from the US has been set up to create a virtual currency which will be superior to Bitcoin. Swiss Bank Announces Custody Solution for Digital Assets. Vontobel revealed that it is launching a cryptocurrency custody service, dubbed “digital asset vault” which will bring more institutional investors closer to cryptos. This week we have chart analysis of Bitcoin, Ethereum, Ripple, BAT and EOS – Read more here. The post Crypto Market Update Jan.22: Bitcoin Stability Around $3500 In Anticipation For Some News appeared first on CryptoPotato.